For two consecutive years, Vertex finished the year on a positive note, with the results for 2018 surpassing both 2017 and 2016. Positive trends in revenue, gross profit, EBITDA and net income were achieved even though the Company faced headwinds in the fourth quarter of 2018 from a drop-in commodity prices, increased differential in WCS-WTI and the curtailment of production that led to decreased activity levels from oil and gas customers in the fourth quarter of 2018. Vertex successfully completed three complimentary and opportunistic acquisitions during 2018 and refinanced its debt at a lower cost of borrowing which contributed to the positive results. Vertex continued to integrate and improve equipment utilization from its acquisitions in 2018 through cross-selling opportunities across service lines, continued geographical and industry expansion, as well as through reducing redundant costs where possible. Vertex's efforts to expand its service offerings and geographic footprint yielded positive increases in utilization rates in both people and equipment. Vertex continues to focus on efficiently managing the costs of the business and diversifying its services, product offerings and customer base both in geography and industry. These efforts should continue to improve performance and the financial position of the Company in order to capitalize on strategic growth initiatives. As commodity prices stabilized in first nine months of 2018, Vertex invested in the Company, diversified the business and generated positive operational results. Revenue increased by $10.8 million to $46.6 million, up 30.2% in the fourth quarter of 2018 from $35.8 million for the same quarter in 2017. Revenue increased by $32.0 million to $150.4 million, up 27.0% in year ending December 31, 2018 as compared to $118.4 million for 2017. This growth is attributable to gains related to the successful cross-selling of services with existing customers and acquisitions completed within the Company's Environmental Services segment. Increases to revenue can also be attributed to the continued focus of Vertex on cross-selling strategies across customers and industries that resulted in additional utilization of people and equipment within the Environmental Services segment. These gains were offset by expected revenue reductions within Vertex's Industrial Services Segment. Gross profit for the fourth quarter of 2018 was $12.0 million, up 41.1% or $3.5 million from $8.5 million in the same quarter of 2017. Gross profit for 2018 increased to $40.5 million, up 25.4% or $8.2 million from 2017. Gross profit as a percentage of revenue ("gross profit margin") improved to 25.8% in the fourth quarter of 2018 versus 23.8% in the fourth quarter of 2017. The increased gross profit is due to improved utilization of people and equipment, steady focus on cost management and positive contributions from acquisitions. Despite improvements in gross profit margin in the fourth quarters, gross profit margin was slightly down in 2018 to 26.9% as compared to 27.3% in 2017. The slight reduction in gross profit margins year over year, is largely the effect the revenue mix. Vertex is dedicated to improving margins of acquired companies during the year with increased equipment utilization, cost cutting initiatives and streamlining operations. The Industrial Services segment experienced a slight increase in gross profit margins due to the Company focusing on higher margin work. General and administrative costs ("G&A") increased by 32.6% or $1.5 million to $6.1 million in the fourth quarter of 2018, from $4.6 million in the fourth quarter of 2017. As a percentage of revenue, G&A was up slightly to 13.1% in the fourth quarter of 2018 from 12.8% in the fourth quarter of 2017. 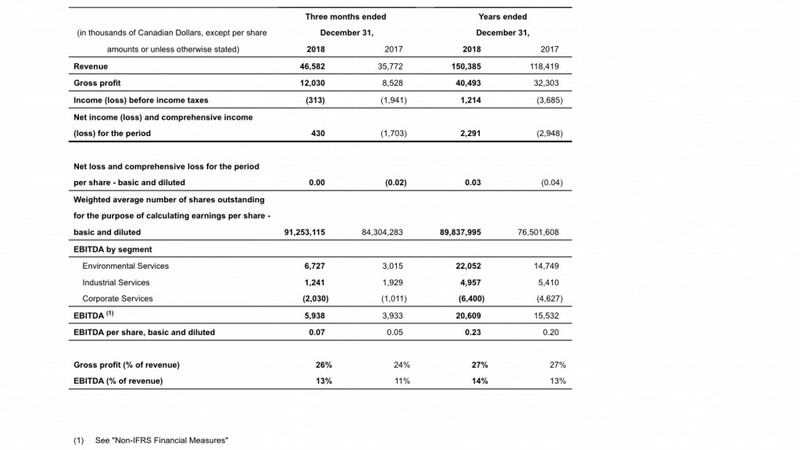 G&A increased by 18.6% or $3.1 million to $19.9 million for the year ending December 31 2018, from $16.8 million in 2017. Vertex added staff, new locations and service offerings in Manitoba, Saskatchewan and Alberta due to five acquisitions completed over the past fifteen months. As a percentage of revenue, G&A was down to 13.2% in 2018 versus 14.2% in 2017. Vertex continues to integrate acquisitions and continues to manage G&A costs closely. Net loss for the fourth quarter of 2018 decreased by $2.1 million or 125.2%, to income of $0.4 million, from a loss of $1.7 million in the fourth quarter of 2017. The loss improved given increased EBITDA and a further gain on bargain purchase offset by the impact of additional amortization expense from recently acquired businesses. Vertex's 2018 net income and comprehensive income improved significantly compared to 2017. Net income for 2018 was $1.4 million or $0.02 per share compared to a net loss of $2.9 million in 2017 or a loss of $0.04 per share. Headed into the first half of 2019, Vertex is well positioned to withstand short term economic pains related to volatile commodity prices and negative investment sentiment in western Canada. This view is based on Vertex's current financial position, strong backlog of $121 million from diverse industries, longstanding customer relationships, and contributions of past, prudently purchased acquisitions which are performing well. Almost 50% of Vertex's backlog is from outside the oil and gas industry. The nine complementary acquisitions completed throughout the last eighteen months are now positively adding to the Company's financial position. These acquisitions allow Vertex to cross utilize people and equipment to service its existing customer base, expand geographically and continue to develop new customers outside the oil and gas industry by offering integrated environmental solutions. Vertex continues to be impacted negatively by commodity price volatility, take away capacity, geopolitical factors and investment uncertainty within the oil and gas industry. Vertex expects to be negatively impacted, in certain segments, for at least the first half of 2019 given some uncertainly around Canadian oil price differentials, related production curtailments, reduced capital budgets of its customers, and associated reductions in drilling and completions activities within western Canada. Also, Vertex expects to continue to face pricing and margin pressure in 2019 because of the negative effects on customer's budgets and cash flows. Vertex is however, seeing additional opportunities in 2019 with increased customer spending on planned maintenance programs, increased activity levels for abandonments and active environmental liability management. In addition, new regulations for emissions testing and reporting will continue to grow Vertex's revenue for this service line. Vertex will continue to focus on growing its business organically, achieving efficiencies, improving margins where possible and cost reductions throughout its business segments. Vertex continues to focus on cross-selling complementary services between segments in order to lower customers' costs and provide integrated solutions for their environmental liabilities. Vertex remains committed to further improving its operational and financial performance while ensuring it is creating shareholder value for the longer term. To achieve these commitments, Vertex continues to focus on reducing debt, reducing its cost of borrowing, actively managing working capital and evaluating its capital expenditure plans to match core and strategic opportunities. Accretive, complementary and opportunistic acquisitions remain an essential component of Vertex's long-term growth plans as it continues to integrate acquisitions and evaluate future opportunities when beneficial.